An interesting thing happened during MSNBC's coverage of Tuesday's primaries: Keith Olbermann humiliated Chris Matthews as studio employees laughed in the background (video after the jump). As the campaign coverage waned late into the evening, Matthews was interviewing Barack Obama supporter Kirk Watson (D), and was trying to get the Texas state senator to list some of the Illinois senator's legislative accomplishments. MATTHEWS: Can you name anything he's accomplished as a congressman? WATSON: No, I'm not going to be able to do that tonight. MATTHEWS: Well that's a problem isn't it? WATSON: Well, no, I don't think it is. Because I think one of the things that Senator Obama does is he inspires. He's able to lay out a vision, he's able to lay out solutions. MATTHEWS: OK, I'm going to have to cut this off because I've been told to, but Senator I'm going to give you one more shot, list Barack Obama's accomplishments as a U.S. senator, now. WATSON: Well, what I will is I will say this to you. He will offer the ability for the United States to be a leader in the world again. He will put healthcare back on the front burner where Americans will have real access to healthcare and not have questions raised about whether they're going to have their wages garnished or have difficulty in that regard. So, I'm proud to be supporting him and I think in Texas we're going to be able to win. OLBERMANN: In defense of Senator Obama, and also in context, can you name one accomplishment of the United States Senate in the last seven years? MATTHEWS: That's a broader question requiring a larger preparation. OLBERMANN: Yeah, you don't have an answer to that, either. MATTHEWS: But, let me say-but, you know what, Keith? They should be able to make some points, here. OLBERMANN: I'm not disagreeing with you on that. MATTHEWS: But I'm not here to defend the U.S. Senate. He's here to defend Barack Obama and he had nothing in his-well, he had nothing to say. OLBERMANN: In two weeks, Chris and I will have complete coverage of the primaries in Ohio and Texas, at which I'm expecting a written reply to my question. MATTHEWS: Why do you think they call it HARDBALL? 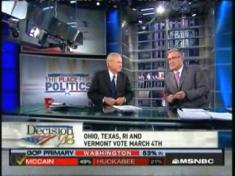 OLBERMANN: But this isn't HARDBALL, we're doing the election results. MATTHEWS: Well, you know, it's late at night and we have to some work. We have to vet the guests occasionally, see if they got something to say. Anyway, thank you. Nice job of humiliating your partner on national television, Keith. Your bosses must be so proud.